Teens Language & Adventures Camp - Boston, Massachusetts Guests overall rating: ★★★★☆ 4.3 based on 3 reviews. Our English School in Boston is located where the USA began. Boston is the urban center of the region called New England, and its most international city. If you choose to study here, you will discover a charming world-class, international city that has a perfect blend of culture, history and education. The skills students acquire studying English at our school, living in our accommodations and engaging in our activities provide them with a foundation for success. 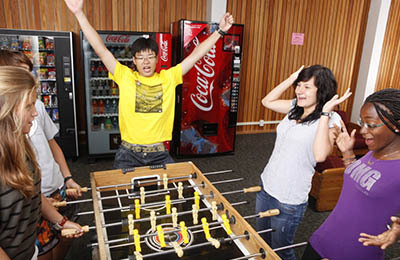 We offer housing options including living with an American host family or an international student residence. We publish a monthly calendar that includes fun social and cultural activities in and around Boston. These activities are a great way for students to get to know the city, their classmates and the staff and continue to work on improving their English skills. 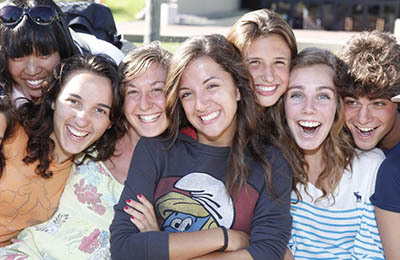 Study English in the summer and have fun with other international students at an Summer Junior Program. Offered during July and August, it includes our 20-lesson per week Semi-Intensive English Course, on-campus accommodation and daily activities. International high-school aged students from 11-17 can enroll , you are sure to meet new international friends from all over the world! Junior students also have the opportunity to study with us during the month of January. The Winter Junior Programs are offered to students between the ages of 14-17. This program gives young learners the opportunity to study English and live with an American host family while engaging in social and cultural activities and excursions with their peers, teachers and staff. Most students are eager to take advantage of the opportunity to live with an American host family in Boston. Living with an American host family is the best option if you are eager to immerse yourself in American culture, improve your conversational skills, and create warm friendships with your host family that will last a lifetime. 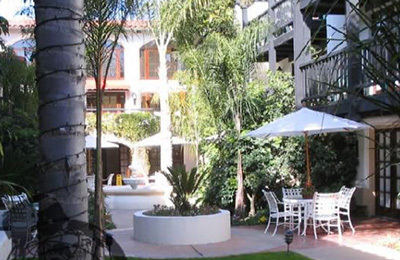 In July and August, we offer additional accommodations in a new ultra-modern residence at a College. It is located in the Fenway area of Boston. Students who live in the College dormitory will enjoy living and taking classes on an American college campus. Beautiful outdoor campus quad with green space as well as tables and chairs. We have been using the most up-to-date English teaching methods and providing high quality English courses since 1978. Our approach to English language learning utilizes the communicative English teaching method, a way of teaching that employs a number of holistic techniques to English grammar, English vocabulary, spoken English, English listening, and English reading and writing. Our holistic techniques prioritize the ability to use these English skills in real-world situations. All teachers are native speakers of American English and have a university degree and specialized training in Teaching English as a Second Language. Teachers create highly-structured lesson plans that provide warm-up exercises, an explanation of the lesson objectives, some form of student production, and a listing of the activities used to reach the objective. Teachers allow students to “discover” the objective, to give them ample opportunity to practice the objective, and then provide an assessment in order to ascertain that the objective has been understood and met. All teachers have had experience studying a second language and many have spent time living abroad. In addition to being highly qualified academically, teachers are warm, friendly, and supportive to all students. Our communicative teaching method is focused on improving communicative competence in English by using techniques where the teacher acts as a facilitator in the classroom, while encouraging students to use the English language as often as possible. We recognize that English grammar is often a challenge for English language learners. Verb tenses, such as simple present, present continuous, simple past, past continuous, simple future, future continuous, and future perfect continuous can be difficult for English language learners to comprehend and to effectively use in real-world situations. Grammar concepts that are introduced through the techniques of discovery tend to be more effective than English grammar concepts that are introduced through more traditional teaching techniques.While our teaching method utilizes resources such as grammar texts and other material to learn basic grammar, we feel that enacting real-life scenarios is the most effective way to teach and reinforce English grammar. English grammar teaching techniques also use grammar exercises that mimic uses of the English language in real-world situations. Our techniques differentiate between formal and informal English so that students feel comfortable switching between the two uses with ease. We focus on refining a student’s structural English skills, and over time increasing his/her confidence using English in social situations. We prefer teaching techniques that are consistent with our method, whereby lessons teach and reinforce English grammar rules by enacting real-life scenarios. English vocabulary is an important part of learning and understanding the English language. English language learners are inundated with English vocabulary every day in the real world through movies, media, and daily life. A student’s vocabulary grows over time and compiling vocabulary lists from resources like books or other texts and materials is a great way to strengthen vocabulary. It is a teacher’s job to make sure that students learn and understand this vocabulary. Teachers can reinforce new vocabulary through a number of comprehension exercises of any unfamiliar words. These exercises may also assist students with the learning and retention of these new words, by using teaching techniques such as vocabulary exercises, word searches, quizzes, and games. Our spoken English teaching techniques stress real-world communication and English conversation versus rote memorization. Because our communicative method is a student-centered approach, the teacher must work as a facilitator in an effort to help students develop English speaking skills for a range of purposes. Our teaching techniques are focused on increasing speaking English in classroom, as well as the pronunciation of words, and utilizing new vocabulary as much as possible. The classroom maximizes dialogue through a variety of techniques, including class discussions, presentations, small group discussions, pair work, group work, special projects, and task-oriented assignments. The school has an English-only policy so that students are be encouraged to speak English throughout the day. Because of the importance of spoken English in real-world situations, it is important that English learners feel comfortable speaking English. Our conversation lessons have elements of all English skills, but our main goal is for the student to learn to express him/her self in spoken English with proper grammar, an accurate vocabulary and superior pronunciation. A good lesson uses teaching techniques that provide many opportunities for classroom dialogue. English listening teaching techniques include class participation, demonstration, and collaboration. It is important for English learners to be able to speak with confidence and use the correct grammar structures so that they are understood correctly, but it’s also crucial that they understand what they are hearing so that they are able to respond appropriately. We use a wide variety of techniques and exercises that can help students improve and perfect English listening skills. These techniques include listening to audio in English, listening to native English speakers in person, watching videos with native English speakers, reviewing English vocabulary from previous lessons, watching and/or listening to news programs in English, responding to questions in English, and reviewing English grammar concepts. Reading and Writing classes focus on topics that are fundamental to English reading comprehension and writing capability. Instructors focus on writing topics such as the five paragraph essay, formal vs. informal English, writing for an audience, writing a resume/cover letter, etc. Instructors focus on reading topics on such topics as short stories, vocabulary, and reading comprehension. In order to choose the best possible materials, instructors refer to an exhaustive list of approved class sets for their appropriate level and select individual chapters from the sets assigned to their level. Instructors supplement these texts with appropriate materials such as internet videos, magazine articles, academic texts, and photographs to enhance the course. Instructors are encouraged to adapt their lesson materials to reflect student interest. The School offers a variety of electives including American Culture, American Slang, Business English, Academic Skills, Film and Media, Accent Reduction, and Creative Writing. These courses allow students to practice English in areas of special interest. English level evaluation with multi-level placement: Placement testing includes a grammar section, a writing section, and an interview with the Director of Courses. The three separate components of the test allow us to make accurate placements for each of the student’s classes. In the Classic Program, students will enjoy the diversity that each city offers through participating in a variety of cultural, sports, sightseeing, and shopping activities. University Explorers will take college preparation classes that cover the SAT and TOEFL tests, as well as study skills and financial aid available to international students. In addition, they will visit local universities where they will participate in tours and information sessions. They will also work on essay writing. Summer is meant for sports and Boston is home to some of the world’s best sports teams: Celtics, Red Sox, Patriots, Bruins, and Revolution. Take advantage of world-class sports facilities and spend your summer playing a variety of sports with students from a variety of different countries. Explore the stadiums and ﬁelds where some of the world’s greatest players on earth spend their time. All Evening and Saturday activities are with host family. The place you live has a lot to do with your overall experience while studying in Boston. Students usually choose to study in Boston because the beautiful city has so much to offer its visitors. Visitors to Boston enjoy strolling through the Boston Common to skate on Frog Pond during the winter and take a ride on the swan boats in summer. Visitors also enjoy participating in cultural visits to the Museum of Fine Arts, Isabella Stewart Gardner Museum and ICA Museum and visiting the famous universities in Boston and Cambridge such as Harvard, MIT and Boston University. They can also enjoy dining and shopping in the trendy Back Bay, South End and Copley Square neighborhoods and immersing themselves in the rich history of Beacon Hill and Faneuil Hall/Quincy Market while on a Freedom Trail tour. Tips: The best things to do and view in Boston, and the best places to travel around Boston. Students who enroll at Boston Teens Language School Boston benefit from studying and living in a charming, world-class city that is young, vibrant, and unforgettable. Boston Teens Language School Boston is located in the best neighborhood in Boston, historic Beacon Hill, which is within walking distance of the Boston Common, the State House, Faneuil Hall Marketplace, Downtown Crossing and many shops, cafes and restaurants. With all the great things to do and see in Boston, we encourage all of our students to get to know Boston and their fellow Boston Teens Language School students by participating in our chaperoned activities. Students who participate in our activities will enjoy visits to Faneuil Hall and Quincy Market, the Freedom Trail, the Museum of Fine Arts and professional sporting events of all kinds. Boston is truly the number one travel destination in the United States for travelers interested in history and culture. You will not need a tour guide to travel around Boston because its small size, safe neighborhoods and great public transportation system make it easy to visit all areas of Boston. Visitors to Boston also like to travel north to the mountains for snowboarding and skiing in the winter and south to the beautiful beaches of Cape Cod and Martha’s Vineyard in the summer. The nearest major airport is Boston Logan International Airport (BOS / KBOS). This airport has international and domestic flights and is 4 miles from the center of Boston, MA..
Study English in the summer and have fun with other international students. Offered during July and August our summer junior programs include our 20-lesson per week Semi-Intensive English Course and daily activities. Our Summer Junior Program runs Saturday to Saturday. Students can book one to seven weeks. Transportation to/from all daily activities and excursions included in the Junior Program. Airport transportation for arrival flights arriving Saturday between 9am – 9pm and departure flights departing Saturday between 9am – 9pm. For flights arriving/departing before 9am or after 9pm, an out-of-window fee will be charged. The Winter Junior Programs are offered to students between the ages of 14-17. This program gives young learners the opportunity to study and live with an American host family while engaging in social and cultural activities and excursions with their peers, teachers and staff. Our Junior Program runs Saturday to Saturday. Special note: Sunday arrivals will not be able to make-up the missed excursion. "The main reason was to improve my English skills in a nice US city like Boston. The best experience was to meet students from all over the world. Though I got to know many things of different cultures like Japan, British, Saudi Arabia and many more. Secondly we were talking about different themes in the conversation skills course which one actually discussed in the US community. It’s great to get an impression of the lot topics. Finally Boston is a great city. There are many parts and other nice places because there are over 60 Universities most of the people are very young. So there are many places and activities especially for young people." "I made a lot of friends from many different countries. The teachers are wonderful and we spent such a great time with them. Boston is an incredible city. I have been living in homestay and enjoyed it so much." "My experience was rich in friendship, learning and discoveries. Moreover, Boston is an amazing city to have fun and visit. "